REMOTE FLY-IN LODGE - Accessible by Alaskan Bush Plane, Stephan Lake Lodge is located 140 air miles from Anchorage in the spectacular Talkeetna Mountains. Our lodge has been in operation since the late 1960s and is one of the finest wilderness lodges in Alaska. We offer a casual atmosphere and comfortable accommodations. TRUE ALASKAN EXPERIENCE - We are proud of our lodge and respect the natural beauty surrounding us. We work hard to maintain this beauty and leave nothing behind but foot prints. Whether you're trekking the wilderness or fishing out of the lodge, you'll be accompanied by an experienced guide. Our goal is that you have an enjoyable, comfortable and safe experience. Outdoor Channel's TV Show "The Best of the West"
Outdoor Channel's TV Show "Beyond the Hunt"
HANDGUN BEAR HUNT - We had the pleasure of having our friends from firearms manufacturer Smith & Wesson visit our lodge and film an episode of "Smith & Wesson USA" to promote their 50-caliber revolver, the S&W 500 Magnum. 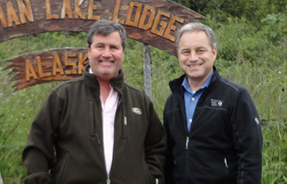 We had the pleasure of welcoming Governor Sean Parnell (R - Alaska) and Senator Neil Riser (R - Louisiana) to Stephan Lake Lodge. Governor Parnell and his staff visited our lodge on the way to viewing the Susitna-Wantana Hydroelectric Dam Project. Senator Riser and his wife lounged at the lodge and had first-hand experience in some of our world-class fishing on the lake. Thank you for the visit, Governor Parnell and Senator Riser!